This is a continuation of my character sketches for my work in progress, Ascension, Book 1: Initiate of Stone. Originally, when Ferathainn was named Rain, and went through half a dozen tumultuous life events, Eoghan was a nameless monk who found the blinded and wounded girl and nursed her to health again, weathering a toxic pregnancy and subsequent abortion in the process. He fell in love with her, but she never saw him before he was called away by the goddess to become her champion/avatar. Then I gave him the name of Arastian. At that time, he was a grown man in his late twenties, and there were some cradle-robbing inferences that I wasn’t comfortable with. Eventually, when I finally researched and chose Ferathainn’s name, I also decided on the Scottish version (or one of them in any case) of Ewen, child of the Yew. I’m an unapologetic Celtophile! (Especially after reading Diana Gabaldon’s Outlander series.) He became a character younger than Ferathainn, and his love for her completely unknown to her, because she never regains consciousness while in his care. I had to put a few more roadblocks in their way. Now he’s a postulant monk, not even tonsured (achieved by the painful process of plucking, which he dreads) and at risk of being turned out of the Monastery of Aurayene as any time, a particular cruelty in a world where the season that equates to winter is actually a deadly season of storms. He becomes Auraya’s Kas’Hadden, her hammer of light in another cruel twist. Eoghan’s brother Callum was to become Kas’Hadden before him, but Yllel, the villain of the novel, conspires to have him executed for heresy before this can happen. Auraya conserves the remnants on Cal’s spirit at the Well of Souls and when Eoghan reaches her, she forges the Kas’Hadden from Eoghan, incorporating Cal’s qualities, and a few other choice bits. Hair colour/style: Strawberry blonde, wildly curly. This doesn’t really change. Build (height/weight): 5’ 4”, slight, not muscular. When he becomes Kas’Hadden, 8’ + and extremely well-muscled, an Adonis. Skin tone: pale and freckled, later golden. Personality traits: Desperately afraid of everything. Self effacing to the point of having little personality of his own. Background: Born eighteen years the junior of two brothers to a spiritually devout public servant and his wife, Eoghan was largely ignored by his father and never knew his mother who died shortly after giving birth to him. His father saw Eoghan as the means of his beloved wife’s demise. His older brother Callum was the favourite, the one on whom all their father’s hopes depended. Initially Callum hated Eoghan as well, tried to smother the baby, but couldn’t go through with it. Surprisingly, Eoghan was the means by which Callum was able to heal from the wound of his mother’s death. Callum became a soldier at a young age and was quickly inducted into the Sanctori but when their father died, Callum took holy orders. Eoghan came with him as a ward of the Faithful initially, and early signs pointed to him following his brother into the priesthood. He proved a fair illuminator, but asked too many questions for the comfort of his teachers. Eoghan has been alternately ignored and protected throughout his life. He is incredibly naïve and Callum’s execution nearly destroys his faith, but the war coming so swiftly on the heels of Callum’s death, Eoghan has no time to internalize his loss. Callum was more a father to Eoghan than their biological one. Eoghan is lost in every sense when Auraya calls upon him. Ferathainn represents his only chance to find himself and choose what he wants to do with his life. Internal conflicts: He’s been so ignored/protected/controlled he has no idea who he is or what he wants to do with his life. When Auraya turns him into the Kas’Hadden, Eoghan finally has the physical power and presence to support his growing internal convictions but is prevented from exercising it on his own behalf. External conflicts: Auraya wants to use Eoghan to defeat Yllel and bring her word back to the people of Tellurin. Yllel wants to destroy him as one of the few beings who could oppose the god’s escape. Auraya. To keep the Kas’Hadden compliant, she suppresses Eoghan’s personality. Ferathainn can’t return Eoghan’s love because of her trauma, besides, he belongs to Auraya and she demands his total devotion. Dairragh doesn’t trust Eoghan and doesn’t believe in the Kas’Hadden. He can’t deny how useful the behemoth can be in battle, but isn’t sure what to make of him. Eoghan attempts to protect Ferathainn from Khaleal, though she proves not to need his protection. I don’t have a drawing of Eoghan. Sadly, I’m not very good at drawing the male figure. So pictures will have to do. When the novel begins, Eoghan is fourteen and hasn’t really hit his first growth spurt yet. He starts to grow a sparse ‘stache and a few chin hairs that might optimistically be called a beard. He’s got this unruly bird’s nest of strawberry blonde curls and a plague of freckles. He’s a skinny, book-fed boy. 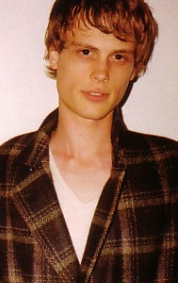 Though the hair colour and freckles are absent, I thought of a young Matthew Gray Gubler as a suitable physical analogue. When he becomes the Kas’Hadden, he’s more like Chris Hemsworth (ala Thor) but has the physical dimensions of the Hulk. Ta-ta for now, my writerly friends! Wow! You inspire me. I write picture books and the advice I’ve been given is to flesh out the character in my story. You’ve done a great job at creating Eoghan! I’m going to follow your lead and use your sketch as my outline. Thanks for sharing!